When we booked a 2-week trip to Germany, I needed to replace my broken old backpack. Timbuk2’s Aviator backpack (the smaller, non-wheeled version) caught my eye. I liked how the front fully unzipped so you could pack with full access, just like a suitcase. I also liked the subtle design and black color; it’s more of a city bag than something you’d take on a camping trip. The reviews were perplexing – some said it was perfect for a weekend trip, some for a week or two. The inner dimensions of the bag weren’t published, so I thought these photos might be helpful to others. Here’s what I’m packing. It helps that we’ll be in an apartment with a washing machine during the first week. I bought the slim packing cubes from eBags and luckily they fit perfectly in the backpack. 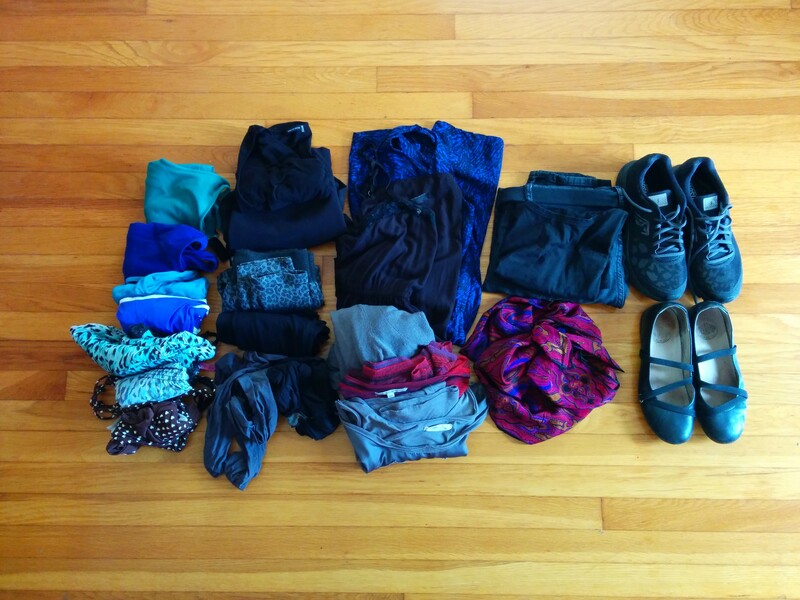 Everything except the shoes and rain jacket easily fit into 3 packing cubes. I packed these in the main compartment along with 1 pair of shoes, an umbrella, a rain jacket, and a hairbrush. I stacked them on their short edge to make more space, but if I didn’t have much else in the main compartment, I would have laid them flat. The top compartment of the bag will fit my glasses, chargers, and a bag each of liquid and non-liquid toiletries. I like this clear quart bag by Flight 001. I felt frivolous ordering it but I’m so tired of sandwich bags that disintegrate halfway through a trip. The backpack zips up nicely and cinches on the sides. That’s it! I’ll tell you how it goes. what size packing cubes from EBags did you use with the Timbuk2 pack? These were the ones I used – the slim size.